Today, Vattenfall, the owner of the Dutch electricity company Nuon, signed a delivery contract for the expansion of the “Wieringermeer” wind farm with the Nordex Group at the Global Wind Summit in Hamburg. The expansion comprises 32 N117/3600 turbines. 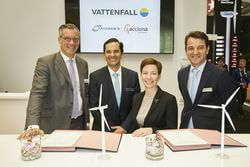 Last year Vattenfall had ordered 50 turbines from the same series, of which construction is currently prepared. The expansion contract entails the delivery and installation of the turbines as well as service for at least two years. “All in all, we are now installing almost 300 megawatts for Vattenfall. The new contract is a very important sign that highlights the mutual confidence which has grown between the Vattenfall and Nordex teams over the last few months,” says Patxi Landa, Chief Sales Officer of Nordex SE. Gunnar Groebler, Senior Vice President and Head of Business Area Wind at Vattenfall, said on signing the contract, "We are pleased to further expand the partnership with Nordex. The contract shows once again that the development of wind power takes on a European dimension - equally for the benefit of the North Holland region, where the project is realized, as well as for the region of Hamburg and Northern Germany, where value creation and thus jobs are secured." The wind farm is located in the province North Holland, in the polder Wieringermeer, about 60 kilometres north of Amsterdam. The site with excellent wind conditions is subject to strict sound emission restrictions, which the turbines are able to meet. The installation of the 32 turbines will take place after completion of the first construction phase. The commissioning of the first 50 plants is planned for 2019. After completion of the whole project comprising 82 wind turbines the installed capacity of Wieringermeer will amount to around 300 megawatts (MW). The wind farm will generate a total of around 1.3 terawatt hours (= 1.3 billion kilowatt hours) of green wind power per year. In November 2017, Microsoft Corp. and Vattenfall signed a contract (Corporate PPA) for the purchase of wind power from Wieringermeer to supply the Microsoft data center Middenmeer north of Amsterdam with a term of ten years.